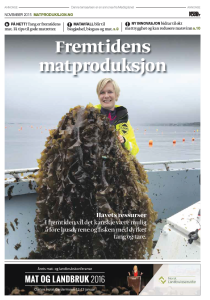 The Norwegian newspaper aftenposten have written an article about PROMAC in the media campaign “Foods of the future”. A printed version of the magazine was published on Sunday the 28th of November, and you can read the digital version of the magazine by clicking on the picture below. The article about PROMAC you will find here (in Norwegian).